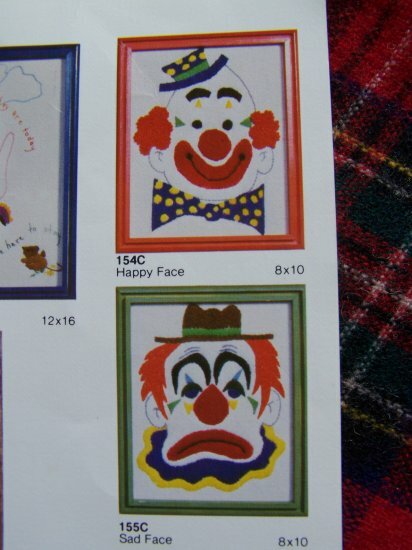 Vintage 1980's The Artistic Needle Clowns # 155C is Sad Face Clown and # 154C is Happy Face Clown. This includes the graph patterns, color picture and some yarn, no needle, no fabric. Yarn has an old smell. Measures 8 1/2 tall x 7" wide. More new and vintage craft kits and patterns listed..
~~ NOTE The second picture of the close up of sad face had the needle through the pattern and it had over time rusted, I removed the needle and tossed. S & H to the USA is 1 penny! S & H to Canada $2.50.